Sweden’s Central Bank, the Riksbank raised interest rates for the first time in seven years on Thursday which might cause further European monetary tightening. 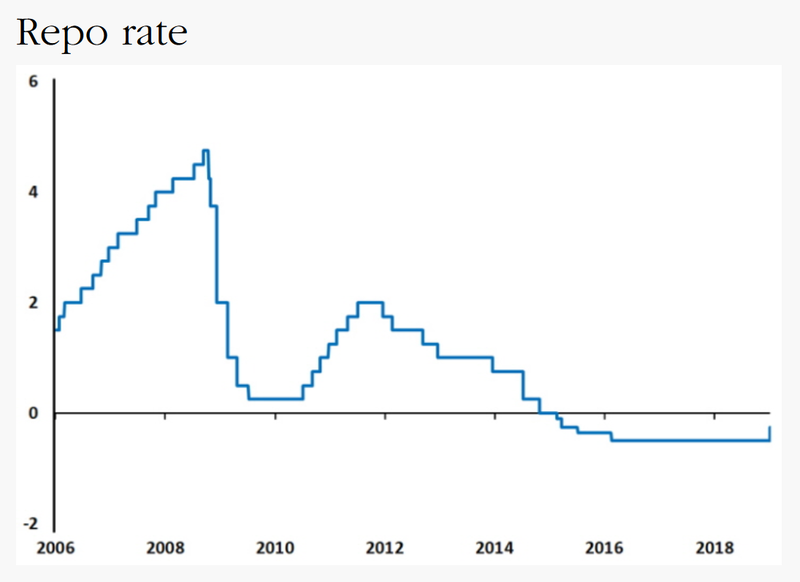 Riksbank’s benchmark repo rate was raised 25 bps from -0.5% earlier to -0.25%. It still remains negative though. 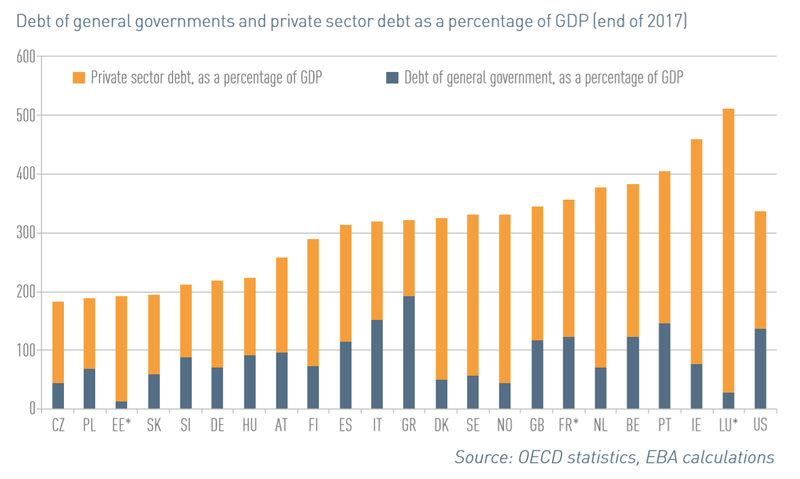 European Union total debt (Debt of general governments and the private sector) as percentage of GDP is now over 300%. Ireland’s total debt to GDP is an eye watering 450%. A decade ago the EU total debt to GDP was 180%, the debt bubble is well and truly here. 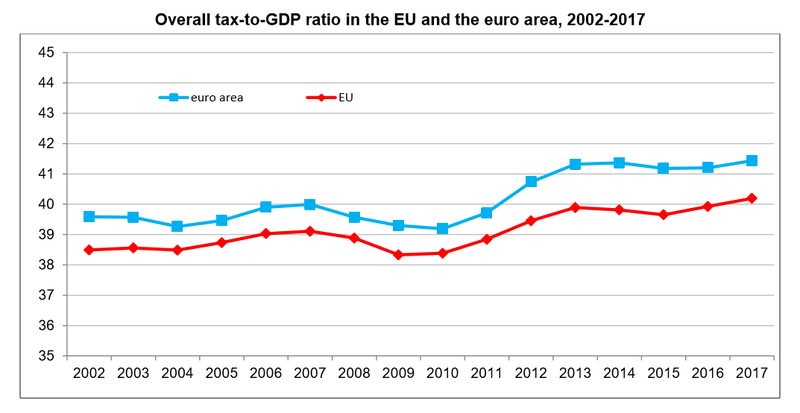 The overall tax-to-GDP ratio, which is the sum of taxes and net social contributions as a percentage of Gross Domestic Product, stood at 40.2% in the European Union (EU) in 2017 and 41.4% of GDP for the Eurozone in 2017. These were the highest ever levels for both the European Union and Eurozone. In January to September 2018, Euro area or Eurozone exports of goods to the rest of the world rose to €1,686.0 bn (an increase of 3.6% compared with January to September 2017), while imports rose to €1,542.9 bn (an increase of 5.8% compared with January to September 2017). As a result, the euro area recorded a surplus of €143.1 bn, compared with +€169.2 bn in January-September 2017. Intra-euro area trade rose to €1,449.8 bn in January-September 2018, up by 5.7% compared with January-September 2017. Both the European Commission and the IMF recently published their forecasts on growth in Europe. Both have lowered forecasts for growth between 2018 and 2020 in Europe. Seasonally adjusted GDP rose by 0.2% in the Eurozone or Euro Area and by 0.3% in the European Union (EU) during the third quarter of 2018, compared with the previous quarter, according to a preliminary flash estimate published by Eurostat, the statistical office of the European Union. In the second quarter of 2018, GDP had grown by 0.4% in the euro area and by 0.5% the European Union. 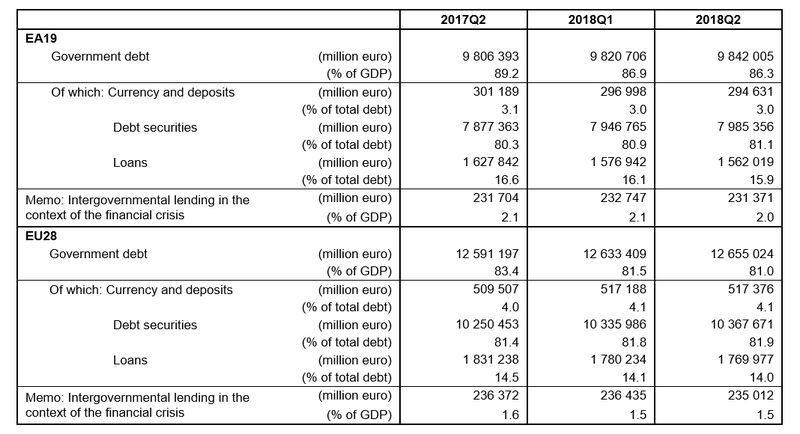 At the end of the second quarter of 2018, the government debt to GDP ratio in the Euro area (EA19) or Eurozone stood at 86.3% and in the European Union (EU28) the ratio stood at 81%. 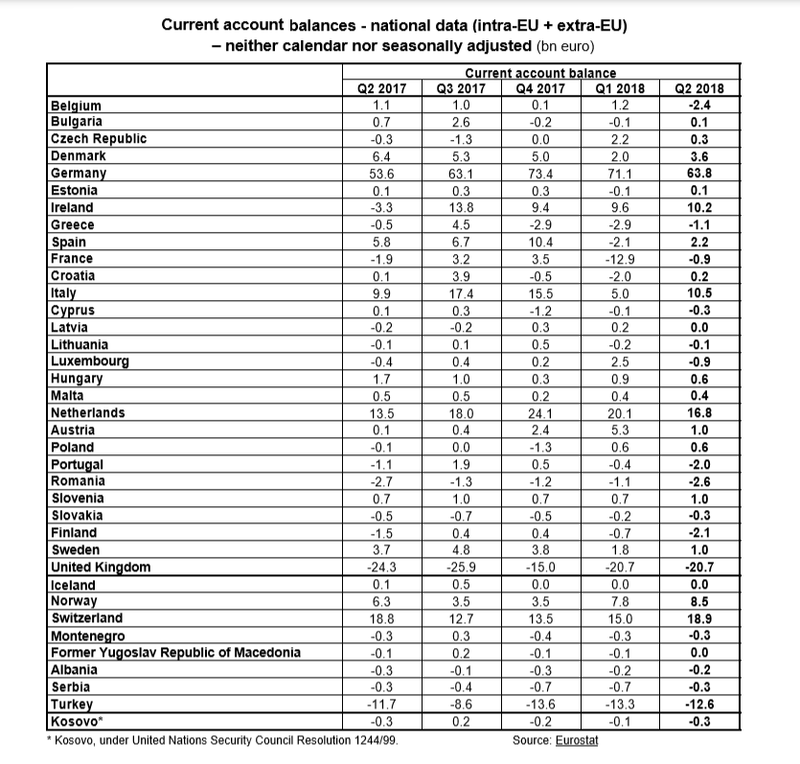 Germany accounts for almost all the intra European Union current account surplus plus the European Union posts a record external current account surplus with the U.S.
Sixteen members of the European Union recorded current account surpluses, eleven current account deficits and one was in current account balance in the second quarter of 2018 for the total (intra-EU plus extra-EU) current account balances of the European Union (EU28) Member States. The highest surpluses were observed in Germany (+€63.8 bn), the Netherlands (+€16.8 bn), Italy (+€10.5 bn), Ireland (+€10.2 bn) and Denmark (+€3.6), and the largest deficits in the United Kingdom (-€20.7 bn), Romania (-€2.6 bn) and Belgium (-€2.4 bn). We have been publishing a number of statistics for the United Kingdom and the European Union over the last few weeks in the run up to a major piece we will be publishing on the real economics of Brexit. This is the final piece before we publish our post on the real economics of Brexit. 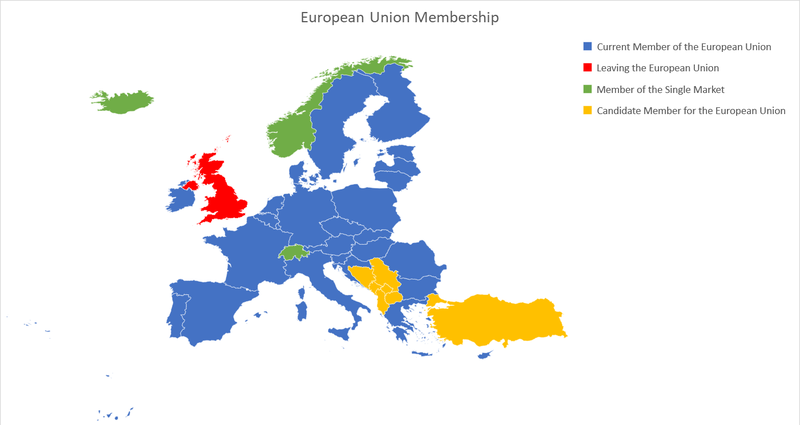 How reliant is the United Kingdom on the European Union for trade? The answer to that is around 52% in 2017 (down from 59% in 1998 and 55% in 2008). 48% of UK exports go the European (EU) Union but 55% of UK imports are from the European Union. Exports to the EU have been decreasing but imports have been increasing. 69% of the trade deficit of the United Kingdom can be attributed to trade with the European Union.